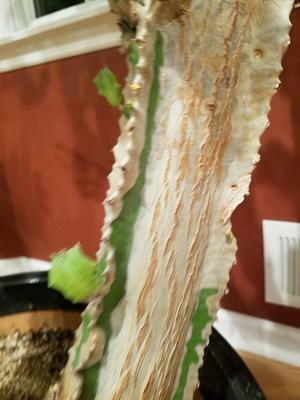 Should I be concerned about my cactus turning brown? 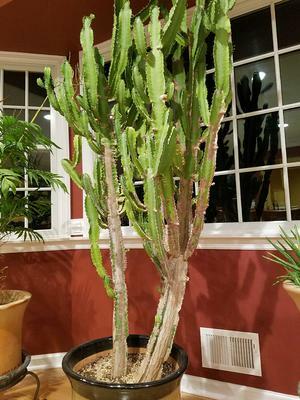 I have a cactus (and please correct me if that is not the proper term for what it is called) that is around 25 to 30 years old. It has been turning brown and scaly looking from the bottom up. The areas are hard to the touch (i.e. not mushy). It has always been indoors and for the last 13 years it has been in the same place in my house in front of an east-facing window. The AC/Heating vent you see has always been closed. I have read about many things that it could be based on other people's posts and pictures but I would like to get feedback on the pictures I am posting. Comments for Should I be concerned about my cactus turning brown? 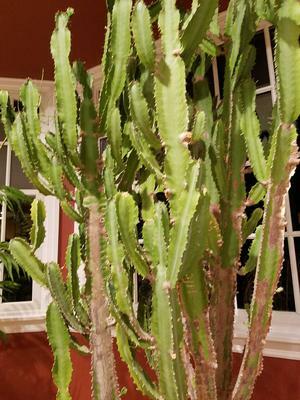 Technically, this plant does fit in the classification of succulent (all cacti are succulents, but not all succulents are cacti), but botanically it's Euphorbia trigona, or African Milk Tree. As they age, they will tend to get woody at the base. No need for concern there. If it gets mushy though, that's usually the beginning of the end. 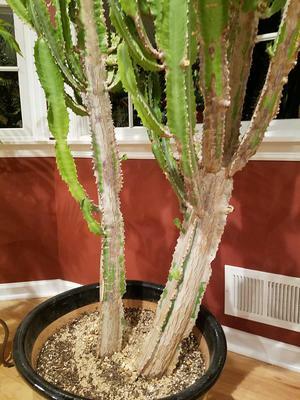 More about this genus here; Euphorbia.